If you have a case with a side window, you don't want to miss out on the chance to make a serious visual impression. For a simple and effective way to do this, light the interior of your case with the cool vibes of a 6" Blue Cathode Tube. Cold Cathode lighting is the most commonly used form of case lighting on the market. 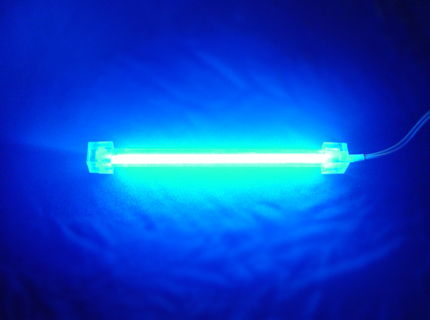 Advancing on the standard 12V neon, cold cathode lamps operate by use on a power inverter, which converts the standard 12V input to hundreds of volts of power. This is done by minimizing the amperage, via the inverter unit. The end effect is an intensely bright and thin tube, the most popular form of lighting today. Our cathodes are fine tuned to push out as much brightness as possible, while still keeping the best lifespan to brightness ratios. Our cathodes will operate for up to 30,000 hours of burn time, while still competing with the brightest tubes on the market.